The way parrots can imitate human speech is not only entertaining but also rather remarkable. Parrots lack lips and teeth, yet they have the ability to learn words, phrases and songs and to imitate tone and expression. What they do have is keen hearing and a voice box with a complex structure that allows them to reproduce sounds. Humans have a larynx, and parrots have a syrinx, located between the voice box and the bronchial tubes. The syrinx branches out in two directions, with each branch opening into a bronchus. Air from a parrot's lungs passes through the syrinx, and the parrot is able to use all of the air to produce sound. A parrot can produce sound with one or both sides of the syrinx, and it can produce two tones at the same frequency at the same time. The complexity of the sounds that a parrot produces is affected by his neck muscles, the length of his windpipe and the structure of his beak. Parrots have thick tongues, so they don't need lips to approximate human sounds. The tongue's thickness, and where a parrot positions it in his mouth, allows him to imitate human speech. When air passes through the syrinx, the parrot moves his tongue to produce sound in his throat and mouth. 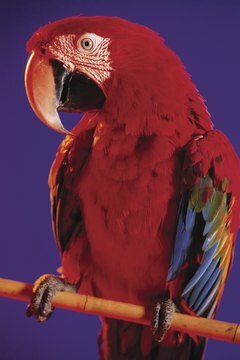 Parrots have a very keen sense of hearing, which they rely on to reproduce human speech so well. Parrots pick up timbre. To reproduce a sound, they need to hear it repeated in the same octave. They hear differently from humans, most notably because they can pick up shorter notes than we can. And they're better at separating sounds delivered in quick succession. Polly wants to tell you she wants that cracker because she, like all parrots, is a very social creature. Parrots are flock animals. Those who are kept as pets imitate human sounds to socialize with their humans, whom they view as members of their flock. How Does a Bonded Pair of Amazon Parrots Act? What Makes Parrots Talk Like Humans?